As part of our Meet the Maker series on our blog, we have created the Friday Feature. On the last Friday of each month we will feature a team member and their Etsy shop, to give you a quick glance behind the scenes and discover more about our diverse team members. I'm Bonita - maker, owner and creator of Bonita Ivie Prints. I currently work full time for Breast Cancer Care, managing their online community. In my free time I create and that's really how BIP was born. I love to sketch (mostly nature) and paint. My other hobbies include eating out with friends, reading about 3 books a month and Pilates which I absolutely love! The main way I got started on Etsy was recognising a huge gap in the market for stationery that ethnic minorities could identify with. I'm a stationery addict, but I found I could only buy notebooks and cards with a very plain and simple aesthetic. Nothing in stores reminded me of where I come from (Nigeria). 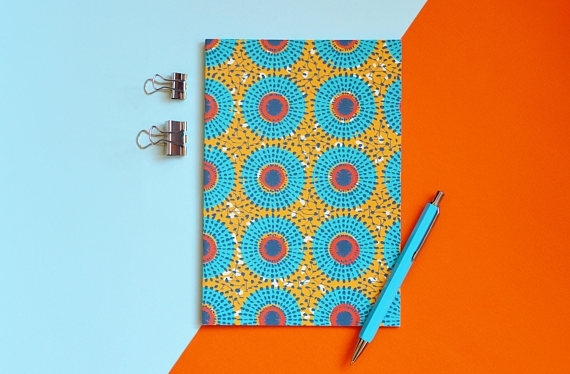 With a huge push from family and friends, my Etsy store selling African print inspired stationery was born! I love the fact that so many people identify with my products and they've never experienced this before. The challenges I face is trying to create new and exciting designs on a regular basis. The large proportion of African prints incorporate elements found in nature, so a lot of my time is spent observing and sketching nature. Those sketches then turn into less complicated shapes using pen and ink. I then digitise these elements in Adobe Illustrator to manipulate the colour. I also use Photoshop to repeat these elements and create the patterns you see in my store. My favourite thing about running my own business is having full control over everything. From the products I put out, what shops and events I choose to sell at and ultimately how I market my business. Every product in my shop has been carefully made by me. I love every notebook, greetings card, pocket mirror and would buy every item. It’s been a great experience so far because I’m passionate about it all. I joined the London Local Team about a month ago and I am benefiting greatly from it already! I joined the team so that I could be part of a local support network and learn from more experienced Etsy sellers. It’s also been a blessing to see that there are regular discussions, meetups and market fairs hosted by the team. I’m really excited to get involved and lend my skills to LoLo. Hopefully in about a years’ time, I’ll feel more equipped to lead sessions and share everything I’ve learnt with Etsy sellers after me.